Anne Hathaway's Cottage, just outside Stratford-upon-Avon, is probably the most famous thatched cottage in the world. The home of Shakespeare's wife has been appearing on calendars, cookie tins, post cards, parlor prints and chocolate boxes for centuries. But you don't have to look far in England and Wales to find more cottages, just as charming, with their own thatched roofs. The craft of thatching may exist elsewhere - the Calvados region in Normandy has its share of pretty farmhouses under thatch and there are thatch roofed houses in the Netherlands, Belgium, Denmark and Scandinavia. But the truth is there are more thatched roofs in the UK than anywhere else in Europe. And when most visitors imagine a typical English village, it's usually full of thatched cottages. Good thing, there are so many. These are some of the prettiest we've seen. The often photographed Beehive Cottage is an outstanding example. This Grade II Listed historic building was probably built around 1833 for the gardener of a nearby estate. To get a closer look at Beehive Cottage, head for Swan Green, Lyndhurst, Hampshire in the New Forest. The green, which has a traditional cricket pitch, is about as picturesque as it is possible to be and remain real. There are several other thatched cottages in the area, many of them older than this one. Beehive is a four bedroom house and is a private home. The owners must be accustomed to visitors photographing it because it is one of the most photographed cottages in the New Forest. Plan a dog-friendly visit to the New Forest. Most thatched cottages are private homes these days. And if you visit a pub with a thatched roof, chances are it will look like any other quaint country pub once you get inside. If you are interested in seeing what the occupants of a typical thatched home had to live with in the days when the material covered most rural rooftops in Britain, plan Stratford-upon-Avon into your itinerary, with a stop at Anne Hathaway's Cottage where you'll get a very good sense of what it was like to live within it. The experience could bring you down to earth with a thud, the romance of these cute dwellings was probably lost on their original occupants as they shivered and choked on wood smoke. But, jump forward several centuries and you'll get a completely different picture. To see a more modern version, book a Secret Cottage tour in the Cotswolds, where the owners welcome you to their cosy, thatched home and even serve you tea in the kitchen pictured here.. Or, for a really unusual experience, rent the 760-year-old Medieval Hall House in Purton Green from the Landmark Trust and you'll vacation in an ancient, pristine, timber-framed house under a deep, picturesque and restored thatch. In the UK, especially England and Wales, thatchers have been practicing their craft since long before the Middle Ages. Archaeologists have found Bronze Age evidence of thatching and archaeological thatch is sometimes found under other materials when ancient historic properties are renovated. In fact, this roofing material has probably been in use in Britain since people first began gathering in villages. And even in the 21st century, there are still about 1,000 professional thatchers covering storybook cottages with thatch of straw, cereals or Norfolk reeds. A good thatched roof not only makes a country cottage picturesque, it is also remarkably long lasting. A roof thatched by a skilled craftsman can last 40 to 50 years without needing refurbishment, all the while providing excellent, watertight insulation. Most thatch used in England is made of long wheat straw grown specially for the purpose. The straw is built up in layers. After about 40 to 50 years, the top layer is stripped off and replaced. Some very old houses still have a bottom layer of straw at least 600 years old. Patterns at the ridgeline are not just decorative. They anchor the thatch in place. Every master thatcher has his own finishing touches, sometimes adding birds and small animals made of thatch. 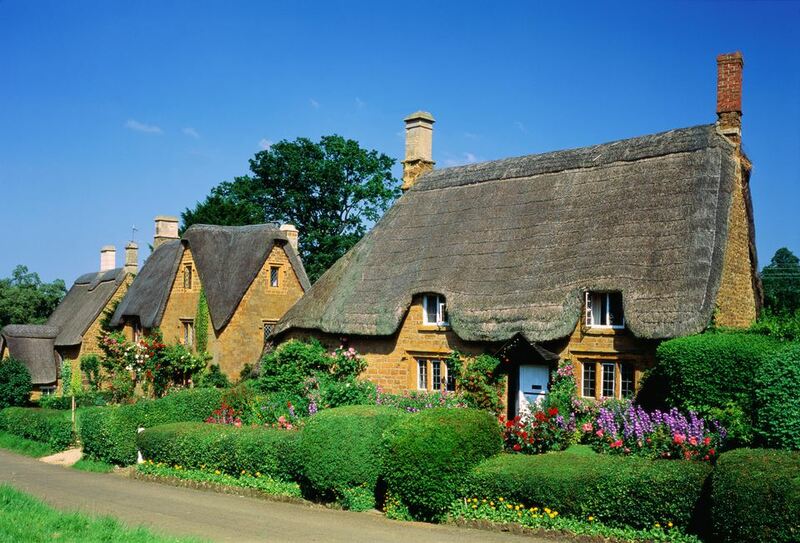 No matter how long they've lived or traveled in the United Kingdom, for most people, spotting a pretty thatched roof during a country drive is still cause for a flurry of excitement. When you tour, be on the lookout for them in Kent, Sussex, Dorset, Somerset and all over East Anglia. Gold Hill, in Shaftsbury, Dorset, pictured here, may be one of the most photographed streets in England. It's been featured in nostalgic commercials, on countless calendars and films. And of course, it has a few thatched cottages. The half-timbered and thatch-roofed, the Royal Oak in Barrington, Cambridgeshire, is right out of a storybook. With or without its covering of snow, this traditional cottage in Great Tew, Oxfordshire, is worth a side trip to the neighboring pub. The entire village of Great Tew, not far from Oxford and from Blenheim Palace, features thatched roofs and Tudor brickwork. These days, most thatched houses are in England, but at Chirk Castle, a National Trust property in Wales that has been continuously inhabited for more than 700 years, the Hawk House in the garden is thatched. Keep a lookout when you are driving in East Sussex, on the way to Brighton or the Seven Sisters chalk cliffs. You will no doubt spot more than one lovely thatched house. Despite what you may have learned from TOWIE (The Only Way Is Essex) on British television, Essex is much more than a suburb for nouveau riche London East Enders. Parts of the county are incredibly scenic and wonderful for discovering small villages and lovely local pubs like the Fox in Finchingfield. There are plenty of thatched cottages to be spotted on a leisurely drive or cycle trip.